This Instruction Article explains how to perform and in-place upgrade to TEKLYNX CENTRAL from v4.0 to v4.5. This can be a very quick and efficient way to upgrade a TC system. Running an in-place upgrade does bring with it some inherent risks however. We recommend you call EBI for advice on if this is the best for your operations. 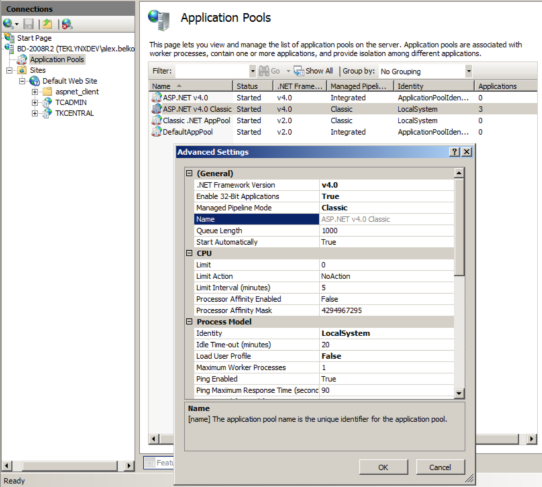 Compatible with Virtual Machines: VMWare 7.1 and higher, Parallels 6.0 and higher. Disable Windows Firewall, User Account Control and Antivirus – should be disabled before installation. Turn Off User Account Control – modern server systems like Windows Server 2012 should be also turned off in Local Group Policies. Windows Server 2012/Win 8: IIS should have the following features enabled: ASP.NET 4.5, и .NET 4.5 Extensibility. Windows 8.1/2012 R2: Microsoft .NET 3.5 installation requires changes of Local Computer policy according to screenshot below. SQL Server 2012: Sysadmin server role should have NT AUTHORITY\SYSTEM membership. SQL Server password should not have hash sign # in the password (Installshield bug). Also it’s highly recommended to not use other special characters. The best is alphanumeric and underscore. In case of connectivity issues (LocalPrint cannot add driver, cannot print etc.) it’s recommended to try turning IPv6 off in network adapter settings. 5. 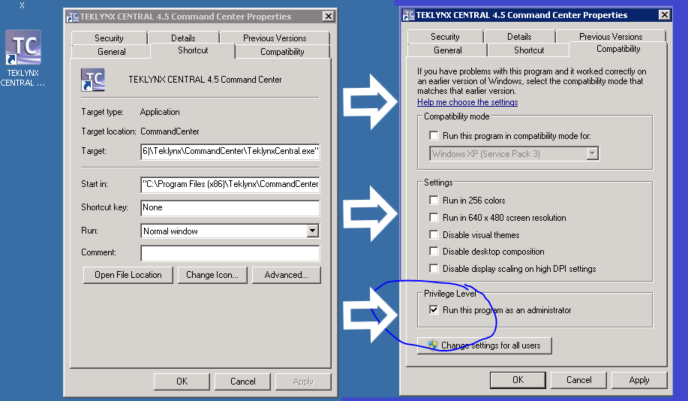 Follow TEKLYNX CENTRAL 4.5 PRINTING INTERFACE – IIS 7.0 CONFIGURATION GUIDE (attached) before installation. Check for other connected users as well. The server may require a few reboots. Upon rebooting, the uninstall process should continue. Be patient. After log in, do not click on anything other thing. Wait until the uninstall program resume. When the application is uninstalled, there is no pop – up window to indicate that the uninstall is completed – just a one – line message on the progress window. Manually Remove v4.0 Folders – Launch Windows Explorer and delete the following folders manually. ProgramData and AppData folders are a hidden folder at the root of C: drive. We recommend renaming all the folders in C:\ProgramData and C:\Users\Public\Public Documents instead (e.g. add “-bak” to the name). Uninstall Client Software (on Client Systems) – remember to reboot after Windows uninstall. Run the program TkcInstaller.exe – pulled from the Central 4.5\Software\TKCENTRALPACKAGE folder. Verify that the Advanced Settings – should be set for the ASP.NET v4.0 Classic as pictured below. CODESOFT consumes 2 licenses: 1 Designer User and 1 Report User for LAS. Remotely installed CODESOFT via Command Center prompts login screen twice. Google Chrome will stop NPAPI plugins support in September 2015. LocalPrint plugin will become unavailable and will need the patch or workaround. Starting from version 42 it’s needed to turn on plugin support manually. Type chrome://flags/ in browser string and press “Enable NPAPI”. Upgrade is possible from previous version only (Oracle from TC 4.0, SQL Server from TC 4.0/4.2). Refresh browser cache after TC update. It’s needed to clear cache via Settings menu of the browser or press Ctrl + F5 on web page. Activation of expired software requires server restart. Google Chrome will stop NPAPI plugins support in September 2015. LocalPrint plugin will become unavailable and will need the patch or workaround.